Made to order or buy from a large range of sizes held in stock. Our FEFCO style 0427 cartons can be supplied plain brown from our range of Postal boxes or as a bespoke box printed with your own branding and design. This style of box makes cost effective packaging as they do not need to be glued which keeps the cost of manufacture down, plus when assembled the sides are double thickness making them a strong and sturdy cardboard box design. 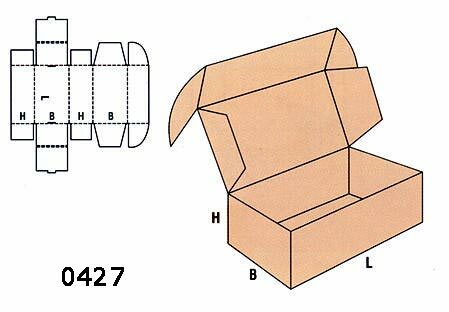 This style of cardboard box is supplied flat for easy storage and is ideal for mailing. Assembly is quick and easy and when the box has been packed with the required items the lid can be closed and the 2 wings on the side of the lid tuck in at the front making the box a very strong mailer pack. The boxes can be supplied either plain or printed in either solid board or E flute corrugated cardboard. We can make these to exact requirements or straight from stock. Please see our Postal boxes range for details of our standard range of mailing boxes, which can be ordered via our online shop.